To Build Your Model Railroad? Like many model railroaders I have a lot of tools picked up over many years. Some only get used once in awhile for specialized jobs. Some are commercial products. Others are homemade. Others I use every day and can't do without. The other day while working on a structure I was reminded of the "One foot rule". The rule is that no matter how big your workshop and workbench, you always end up working in a space of about one square foot surrounded by stuff you haven't put away, junk that hasn't been thrown out, magazines, paper, instructions, stripwood and styrene, bottles of glue, paint and maybe some empty coffee cups or pop bottles. It's not surprising when you consider all the things we need tools for as model railroaders: to design a model railroad, for trackplanning, for benchwork, building rolling stock and structure kits, painting, scenery, wiring a model railroad and electronics. Do these areas around my workshop look like yours? 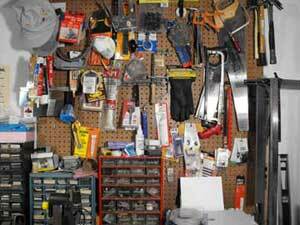 The pegboard behind my workbench is a catch-all for tools of all types and sizes. I can see them and reach for them as needed. No hunting required. Of course, my workbench drawers are another matter! A "Lazy Susan" turntable sits at my left hand. 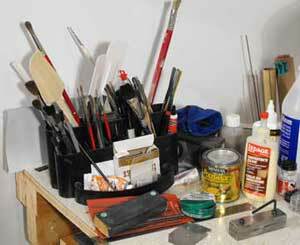 I use the "Lazy Susan" for paint brushes, glues, pens and other long utensils like the spatula for plaster work. The bottom receptacles are great for razor blades, tooth picks and other small items. The turntable is surrounded by things needed for current projects just outside my one-foot square working space. Return from "Tools" to my Home Page.